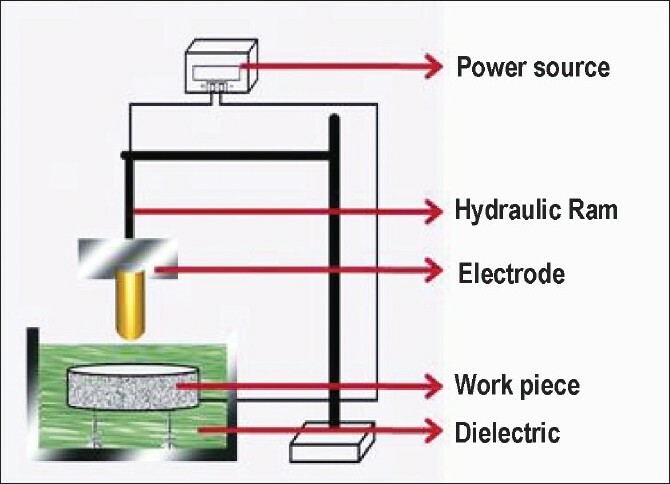 Spark erosion is a metal removal process using electric current under carefully controlled conditions. It is used for precise and accurate fabrication in the field of fixed, removable and implant prostheses. The scope of this article is to discuss the mechanism of action of the process and its significance in implant dentistry along with critical evaluation of its merits and demerits. Background: The primary etiologic factor for peri-implant infections is the adhesion of biofilms on oral implant surfaces in the area of soft-tissue penetration. The aim of the present study was to examine in situ biofilm growth directly on implant-abutment surfaces without the use of oral splints and to determine the effect of intraoral abutment localization on biofilm growth. Materials and Methods: Fifteen titanium healing abutments were inserted in six patients for 14 days. The newly formed supragingival biofilm on the titanium surface of the healing abutments was stained with fluorescent Live/Dead Baclight kit before examination by confocal laser scanning microscopy. The biofilm was scanned in terms of its surface coverage and thickness and different sites. Results: The results show that the biofilm has a different structure in every patient, with the thickness of the biofilm structure ranging between 0 and 80 ΅m and the surface coverage between 0 and 97% of the abutment surface. There was similar biofilm surface coverage at different intraoral locations, whereas the biofilm was significantly thicker in the mandible as compared to maxillary implant abutments. Conclusion: The method uniquely describes an effective way to depict biofilm development on implant surfaces in the supra- and sub-gingival regions. Background: The long-term success of an implant depends on the stability of bone support for the implant. Most crestal bone loss occurs in the first year of implant placement. Platform switching is an approach which can be clinically applied to preserve the crestal bone. 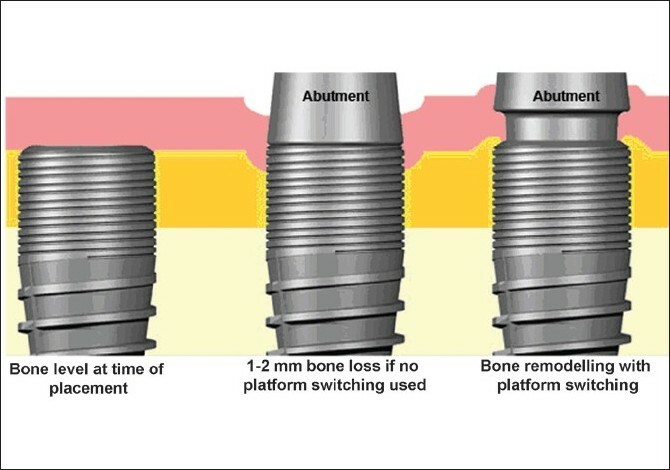 Purpose: The purpose of this review is to discuss the literature dealing with the platform switching concept to preserve the crestal bone, the mechanism by which it contributes to maintenance of marginal bone, its clinical applications, advantages and disadvantages, in order to assess its survival rates. Materials and Methods: PubMed and Google Scholar were used to find studies involving platform switching concept from 2005 up to October 2009. Results: Literature search revealed studies involving concepts of platform switching, comparison of platform-switched and non-platform-switched implants, case reports on platform switching and studies with histological and finite element analyses regarding platform switching. Conclusion: Platform switching helps preserve crestal bone around the implants and this concept should be followed when clinical situations in implant placement permit. Background: The evolution in implant procedures has helped decrease loading times. Procedures can be optimized in post-extraction implantation with immediate loading. With a decrease in periodical needs for oral rehabilitation, the biological impact and psychological integration may be improved. This study aims to compare immediate versus delayed loading in post-extraction implantation. Materials and Methods: In a private practice of two practitioners, 170 Straumann post-extraction implants (107 immediate and 63 delayed loading) were tracked during a 7-year period. Results: According to Misch criteria, no difference in success rates was found between immediate (96.4%) and delayed (96.8%) loading in post-extraction implants. Conclusion: This retrospective study showed that a post-extraction procedure does not compromise immediate loading success in the short and medium term. Complementary prospective and randomized studies are necessary to validate these results. 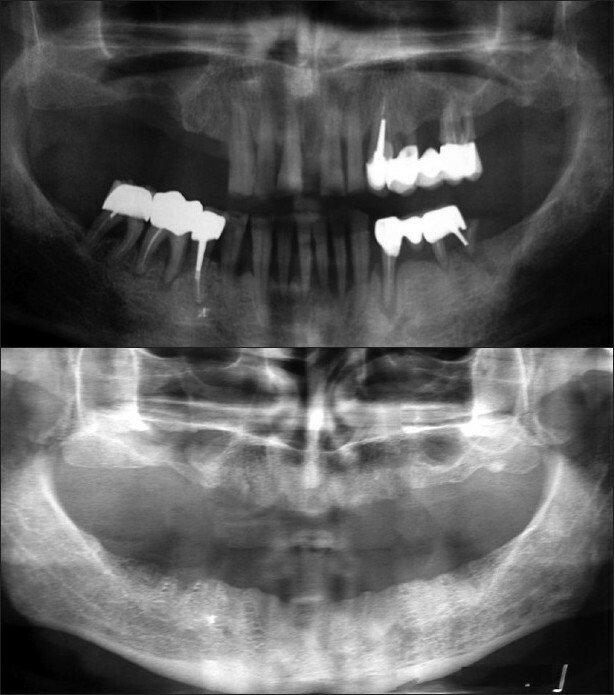 This article is a case report of removal of a dental implant using electrosurgery. A discussion will outline a possibly less invasive method to remove the dental implant. This involves the use of electrosurgery unit to cause a thermo-necrosis of the bone and therefore a weakening of the bone-implant interface. It is suggested that a controlled laboratory experiment be carried out to look at the effects of mono-polar electrosurgery on osseointergration on dental implants and the possible use of this method to allow for simple removal of poorly positioned fixtures and also fixtures with significant bone loss but no mobility. The purpose of this study is to determine the predominant periodontopathogenic microbiota in peri-implant sulcus of osseointegrated implant of a healthy patient. A healthy patient with good periodontal condition was selected for AQB single-piece implant placement. Periodontal pathogens were checked in patient's saliva prior to implantation. F. nucleatum (0.25%) and B. forsythensis (0.01%) were detected. 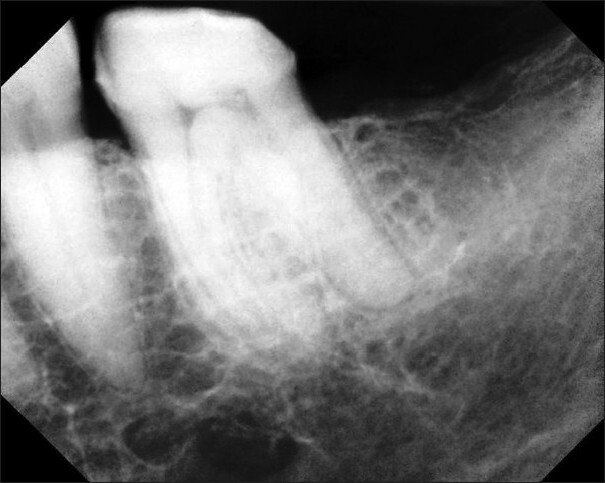 An HA-coated one-stage implant (AQB) was implanted in the missing lower second molar region. Then samples were collected from the peri-implant sulcus using paper point, every month for eight months after the implantation and fixation of porcelain crown. RT-PCR (invader method) was used to detect the periodontal pathogens. No periodontal pathogens were observed up to three months. F. nucleatum (0.16 %) was detected at three months, T. forsythensis (0.06%) and F. nucleatum (0.06%) were detected after four months. A. actinomycetemcomitans (0.054%) and F. nucleatum (3.29%), were detected at six months. F. nucleatum (5%), (1.58%) were detected at seventh and eighth month. 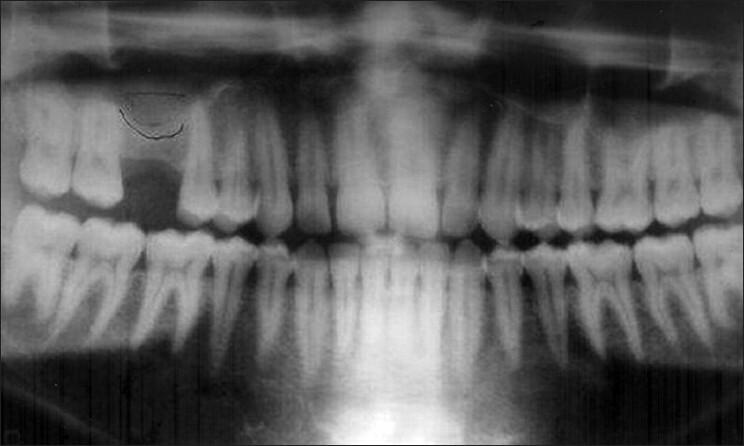 An atrophied posterior maxilla is the most challenging intraoral area confronting the implantologists, requiring utmost skill for the achievement of successful results. 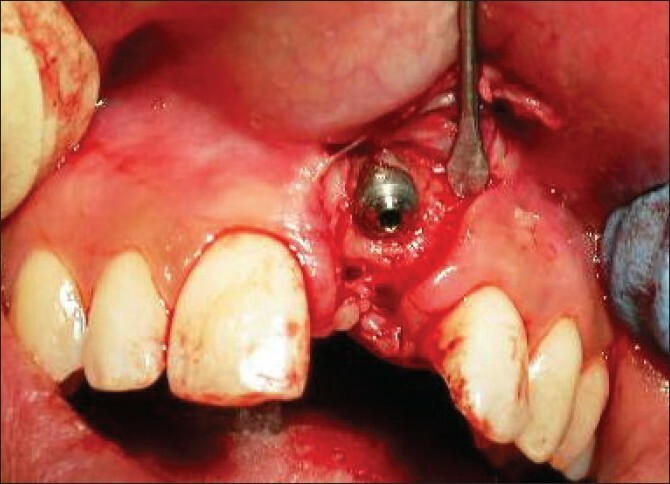 This case report exemplifies the use of a lateral wall osteotomy approach for sinus floor elevation, combined with the composite grafting to provide the ideal milieu for placement of a dental implant. Restoring the edentulous patient with an esthetic and functional reconstruction may present numerous challenges to the clinician. The patient's occlusal vertical dimension, centric relation, esthetics and phonetics need to be determined and maintained throughout the restorative process. This clinical report describes the fabrication of implant supported fixed prosthesis and implant-tissue supported overdenture with low-profile attachments and its step-by-step approach to provide an esthetic result for a patient with limited inter-arch space.